Be the first to share your favorite memory, photo or story of Evelyn . This memorial page is dedicated for family, friends and future generations to celebrate the life of their loved one. Evelyn Vaverka Engelking passed away on Sunday, November 11, 2018. She was born on December 24, 1932 to Lidmill E. and Stella Houska Vaverka in Hennessey, Oklahoma. She received her early education at Center View School and graduated from Hennessey High School with the class of 1950. She continued on to college getting a degree from Oklahoma A&M College, now known as OSU. She married Rae A. Engelking on August 25, 1952. They had four children, Rae, Teresa Cobb, Ernest and Frank. They established their home on a farm in Kay County. 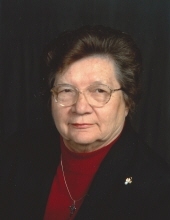 Evelyn was the first woman to serve on the Kay County Conservation board serving as Treasurer. She also served on the Kay County Floodplain Management board serving as President. Evelyn adored her grandchildren and loved spending time with them. Evelyn was preceded in death by her parents and her husband, Rae Sr.
She is survived by her children, Rae Jr. and wife Darlene, Teresa Cobb and husband Russell, Ernest and wife Sandy, and Frank and his wife Jackie, her grandchildren, Richard Cobb wife Jill, Teri Bruner and husband Christopher, Ryan Cobb, Jacob & Alayna Engelking, Jared Engelking, Clay Morgan and wife Beth and Kelly Kelley and husband Justin, great-grandkids Kaylee, Aubry, Brinley Cobb, Aiden, Karsten, Jett Bruner, Colton Cobb, Cooper Engelking, Piper, Colson Morgan and Kathryn Kelley and her sisters, Wilma Fuxa, Dolores Green and Janice Hampton. A Rosary Service will be held on Thursday evening, November 15th at 6:00 pm at the Trout Funeral Home Chapel in Ponca City. A Mass of Christian Burial will be held on Friday, November 16, 2018 at 10:00 am at Saint Francis of Assisi Roman Catholic Church in Newkirk, Oklahoma. Following the ceremony, Evelyn will be laid to rest next to her husband in Newkirk Cemetery. Friends and loved ones may pay their respects at the funeral home on Wednesday, November 14th until 8:00 pm. Honorary pall bearers will be Jill Cobb, Christopher Bruner, Kelly and Justin Kelley, Ryan Cobb, Jon Engelking and Alayna Engelking. In lieu of flowers, memorial donations may be made to Saint Francis Catholic Church to help add park benches to the playground area, Attn: Debbie, PO Box 11, Newkirk, OK 74647. Services are under the direction of Trout Funeral Home & Crematory in Ponca City. To send flowers or a remembrance gift to the family of Evelyn Vaverka Engelking, please visit our Tribute Store. Funds will go toward park benches for the church's playground area. "Email Address" would like to share the life celebration of Evelyn Vaverka Engelking. Click on the "link" to go to share a favorite memory or leave a condolence message for the family.